I bet you guys collected a TON of awesome ideas with the last Bright Ideas Blog Hop! I LOVED reading all the creativity and sheer brilliance in all these classrooms! I am so excited to participate in another one! Last blog hop I shared about practicing math facts in the hall. Short and sweet. 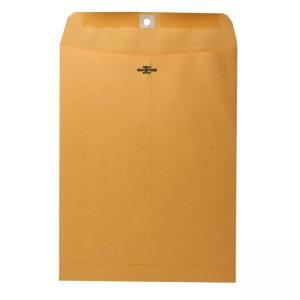 Today I am going to share about one of my most FAVORITE organizing tools in the classroom: the clasp envelope. First, I am going to take a right turn (squirrel!) 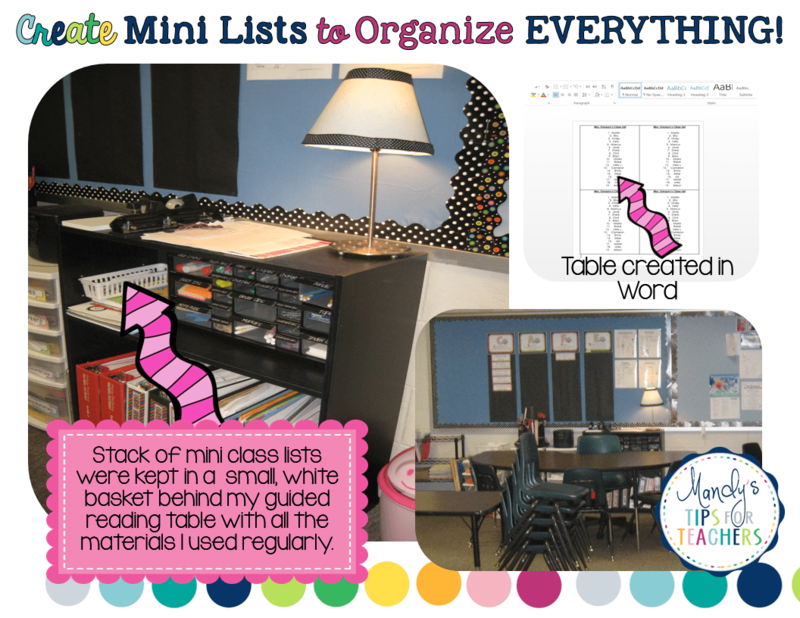 and share a second favorite organizing tool for the classroom: mini class lists. I use these whenever I collect papers from students. LOVE THESE! I simply open a Word document and insert a 2 by 2 table. Then I type a class list in each cell so I get four mini class lists to a page. I LOVE my mini lists! I always kept a stack of them behind my table. I used them ALL THE TIME. OK, back to the star of the show: the clasp envelopes. When it was time to collect papers like permission slips, beginning of the year paper work, mid term reports, anything that I needed to keep track of to make sure each child returned I pulled out a clasp envelope and stapled a class list to it. 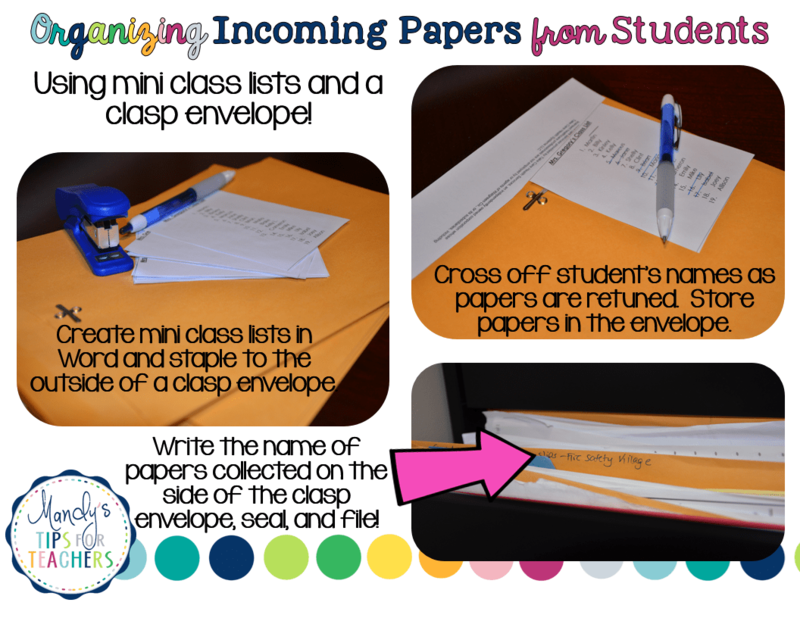 Then as students returned the papers, I crossed his or her name off the list, and put the paper in clasp envelope. When I received all the papers. I wrote the name on the side of the envelope, and filed it! I also used the same idea with just regular old file folders! This worked perfectly for the writing samples from each genre I had to keep from each student. I simply made a narrative fie, stapled the class list to it, and put the entire classes’ work in it. Much better than filing it in each kids portfolio and then have to pull them out to be refiled in a (different) end of year file. I actually kept several sizes on hand in my classroom. Students used the 6 x 9″ to store their classroom money in. Then I used the 9 x 12 and the 10 x 13″ sizes for a variety of different things- like filing papers and centers. The 9 x 12 ” size fits nicely in a file cabinet! If you are looking for more great ideas about awesomely cheap math manipulatives, please visit the next blog on this blog hop, written by Sarah! She shares some great tips! Class lists are amazing!! I started using them this year since I have 4 different classes and they have been a huge timesaver! I do the same thing with the mini-lists! The only time I wish I'd not made so many copies is when I get a new student lol! Great tip about the kraft folders! I have mini lists too! I use them for everything. I use them when I collect important papers too but never thought to use the clasp envelopes. That is a good idea! Mini lists are my savior! They help keep me sane! Love the clasp envelopes…I need to pick some more of those up! I love your ideas. I will have to adjust and change over to the 4 on a mini-list_ Just one more idea if anyone wants… I have a couple student lists that I laminate. I use a permanent marker to check off names or dry erase marker. Wipe them off and reuse them.